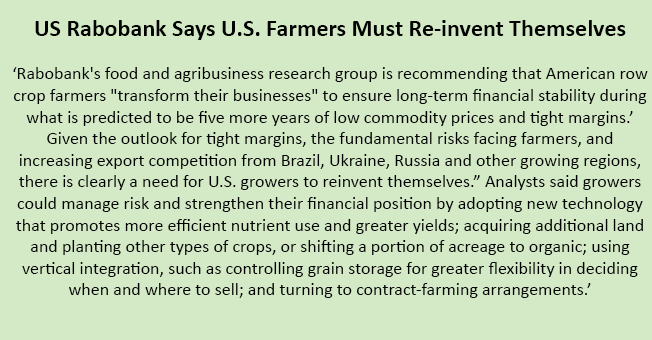 What is interesting in this quote is that most of the strategies suggested here are for managing and improving production outputs. Of course, without production there will be no income. But as a producer, how do you assess what is providing your business with the best financial return? One of the main drivers to remaining competitive is measuring your cost of production at the end of each season. This information can provide powerful insight into how your business can be improved into the future. Why is knowing your cost of production important? Farmers in Australia are generally ‘price takers’ i.e. you have little influence on the price at which you sell your produce apart from choosing the time of sale or the type of contract. Knowing your actual cost of production is essential to this process to guarantee you are selling at a price that will provide a profit over the cost it took to actually produce. In the long run, the lowest cost of production wins and that is where you want to be! The chart below shows how the cost of production can be used. If this farm’s cost of production was $240/t, then wheat would only contribute to profits in 5 of the 10 seasons. If the cost of production was $180/t, wheat would have contributed to the farm’s profits in all 10 seasons. Is this wheat enterprise carrying its share in the rotation? What rotation selection may provide better margins? Is there another farming system that would provide improved margins? How easy is it to calculate your Cost of Production (COP)? Calculating your actual cost of production takes discipline. However, with systems put in place the first time it is calculated, it should be easier in subsequent years. Where can I get help to calculate my Cost of Production? GRDC’s ‘Farming the Business’ manual, available in hardcopy or online from their website. Refer to Section 5.2.6 ‘Cost of Production’. GRDC’s ‘Cost of Production’ Factsheet, also available on the GRDC website. 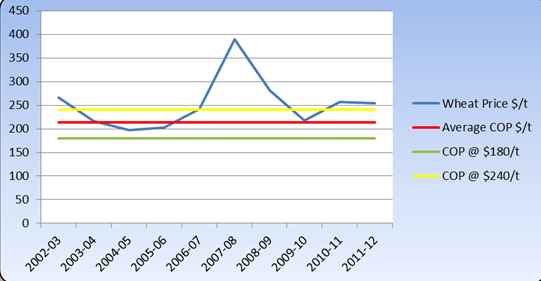 However, a more powerful resource is available to you through the P2PAgri’s SEASON software. The advantages of using this software are that it allows you to easily enter your own data and get the calculations completed for you, and provides reports on your business trends over time…essentially, your own business benchmarks:. If you are unsure about doing it yourself, access an Accredited P2PAgri Adviser who can develop these business analysis and reports for you. Alternatively, you could join a good farm business benchmarking group that helps gather this information and reports your cost of production back to you. The key is to do this every year, so you can see the business trend for each enterprise in your farm business. As the cost of production is significantly influenced by the particular season experienced, a range of seasonal results will give you a better picture than just one season!